But because we’re so accustomed to walking the path of fear first in our lives (play it safe, there’s not enough good men out there, what’s this woman going to teach me that I don’t already know…), many aren’t willing to make a commitment to or invest in themselves or their love lives. They begin to see their true hearts and how precious a gift that is. They begin to get incredibly comfortable in their own skin. They get crystal clear about what they want in love. They set boundaries about how they want to be treated. They begin showing up differently as they meet new people with a new level of confidence. They know what they want and they express and honor those desires. They are incredibly self-aware about what has unintentionally tripped them up before and now know how to create a different experience for themselves in love. They begin to see that who they’re attracting and intentionally spending time with looks dramatically different than it did before. Their lives begin to look and feel like love. When you think about creating the love you really desire in your life, are you walking in fear or love? Are you hiding and playing small, becoming focused on what you’re doing rather than who you’re becoming? Are you constantly seeking answers or trying to “fix” yourself, but rarely take the time to put what you learn into practice or change habitual behaviors? Or are you seeking out the people who have been where you’ve been and know what you’re going through? Are you dropping the stories and false beliefs that have held you back? Are you setting healthy boundaries and honoring your needs? Are you investing in yourself – not just through money, but through time and energy? Do you know, inherently, how absolutely worthy you are – just as you are? 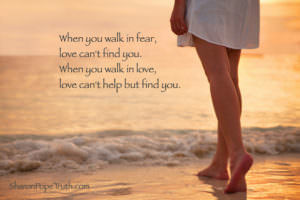 When you walk in fear, love can’t find you. When you walk in love, love can’t help but find you.